Integrating the DECT Multi-Cell wireless telephones with the KX-TDA50 means that the benefits of your phone system can follow you where ever you are on your premises. 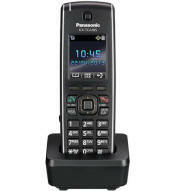 Digitally enhanced wireless telephony allows voice and data transmission via radio waves, within the range of up to 8 tragically placed Panasonic KX-TDA50 cell stations. 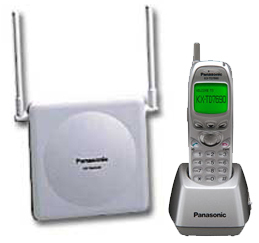 As you move through out the coverage area, the system provides seamless communication by handing off the call from cell station to cell station. It's a low cost and highly flexible solution that keeps you and you associates connected whether they are in the warehouse, in the show room, in a home \, or just about anywhere on the site. 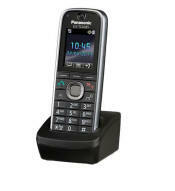 What is a Multicell Cordless or Wireless Phone? 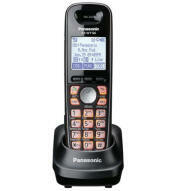 A multicell cordless phones is a cordless or wireless phone type of system designed for large square footage applications like a warehouse or school, As a phone user walks across a large area, school or warehouse the user can stay connected to the phone system as the user loses connection from one cell station the user can connect to another cell station. 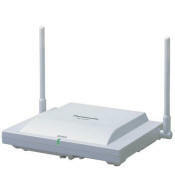 Up to four cell stations can be added to accommodate 28 wireless telephones. 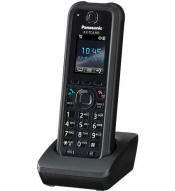 8 wireless telephones can actually be in use at one time.